Brother Pháp Lưu (Brother Dharma Stream) is an American-born teacher and author who Thich Nhat Hanh ordained as a monk in 2003. 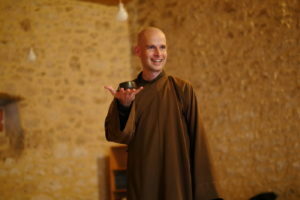 Brother Stream received the lamp transmission from Thay in 2011 and became a dharma teacher. He has shared his dharma wisdom around the globe. He is active in the Wake Up movement for young people and also supports the Wake Up Schools initiative, to bring mindfulness programs into schools. He feels a deep obligation to bring the simple practice of mindful breathing and embracing difficult emotions to all levels of education. Join Brother Pháp Lưu for a retreat on the Awakening Together Tour this Fall.